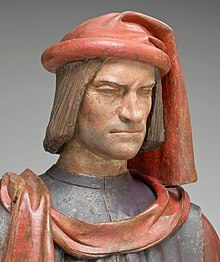 Lorenzo de' Medici (Italian pronunciation: [loˈrɛntso de ˈmɛːditʃi], 1 Januar 1449 – 8 Aprile 1492) wis an Italian statesman an de facto ruler o the Florentine Republic, wha wis ane o the maist pouerfu an enthusiastic patrons o the Renaissance. An aa kent as Lorenzo the Magnificent (Lorenzo il Magnifico [loˈrɛntso il maɲˈɲiːfiko]) bi contemporary Florentines, he wis a magnate, diplomat, politeecian an patron o scholars, airtists an poets. He is well kent for his contreibution tae the airt warld bi sponsorin airtists such as Botticelli an Michelangelo. His life coincidit wi the matur phase o Italian Renaissance an his daith coincidit wi the end o the Gowden Age o Florence. The fragile peace that he helped maintain amang the various Italian states collapsed wi his daith. He is buried in the Medici Chapel in Florence. ↑ "Fact about Lorenzo de' Medici". 100 Leader in world history. 2008. Retrieved 2008-11-15. ↑ Kent, F.W. (2006). Lorenzo De' Medici and the Art of Magnificence. USA: JHU Press. p. 248. ISBN 0-8018-8627-9. ↑ Gene Brucker, Living on the Edge in Leonardo's Florence, (Berkeley: University of California Press, 2005), pp. 14–15. This page wis last eeditit on 14 Apryle 2019, at 16:02.